﻿Tartan Day: Calendar, History, Tweets, Facts, Quotes & Activities. National Tartan Day is a celebration of Scottish heritage and also marks the anniversary of the signing of the Declaration of Arbroath. The Declaration of Arbroath is a declaration of Scottish Independence, signed in 1320. The declaration is in the form of a letter addressed to Pope John XXII and declared Scotland as an independent and sovereign state. The declaration was written at the Arbroath Abbey by Bernard of Kilwinning, Chancellor of Scotland and Abbot of Arbroath. National Tartan Day originated in New York City when the mayor, Ed Koch, declared July 1, 1982 as Tartan day, a one-time celebration of the 200th anniversary of repealing the Act of Proscription (August 12, 1747), which had forbidden Scots to wear tartan. 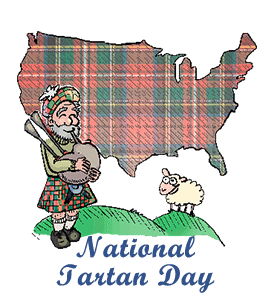 Then in 2004, the National Capital Tartan Day Committee lobbied US House Representatives to designate April 6 as National Tartan Day, a day which was adopted on March 9, 2005. Although the word plaid is used in North America to describe a pattern, in Scottland, Tartan is the pattern and plaid is a piece of clothing with a tartan pattern. According to the 2014 American Community Survey by the United States Census, there are 5,365,154 Scottish American residents. Americans of Scottish descent have made enduring contributions to our Nation with their hard work, faith, and values. On National Tartan Day, we celebrate the spirit and character of Scottish Americans and recognize their many contributions to our culture and our way of life. - President George W. Bush, April 4 2008, Presidential Proclamation National Tartan Day, 2008. Create a tartan that is unique to your 'family clan'.